For users with an active lifestyle and looking for a wheelchair that adjusts to their specifics, the manual wheelchair Invacare Top End Terminator is the ideal choice. This full frame aluminum wheelchair made by the experts at Invacare is made to be super customizable, lightweight, and strong. It combines great design with top materials and features in order to bring users something built specifically for them, while staying right on budget. At Orthopedic Service Company, we proudly bring our customers mobility solutions that fit them right. This is why we only work with the best brands in the field, Invacare being one of them. As the mobility specialists that we are, we work hard to put our customers on the road to greater independence and freedom of movement. Developed with the strongest and lightest materials available, the manual wheelchair Invacare Top End Terminator is designed to hold a standard weight capacity of up to 250lbs, and it’s Heavy Duty option can support up to 350 lbs. 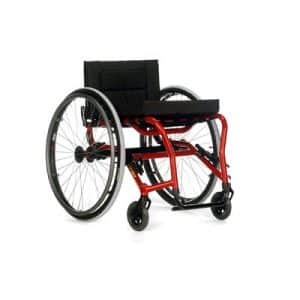 This ready to roll wheelchair brings users a wide selection of seat heights, wheels, arm styles and footrests to choose from, with dimensions built to exact specifications so that users can feel confident riding something that was built specifically for them and. Custom 6061T6 aluminum rigid frame with tapered or V-style front frame, tapered seat width, fixed seat heights, and fixed or folding back. Adjustable tension back and seat upholstery, center of gravity, backrest height and footrest. Invacare adjustable camber system with camber available in 0,3,6, 9 or 12 degrees or single camber tube with one choice of camber in 0,3,6 or 9 degrees. High push to lock or undermount wheel locks – 3″, 4″, 5″ or 6″ front casters. 22″, 24″, 25″ or 26″ high performance rear wheels equipped with high pressure clincher tires and anodized handrims. As the mobility specialists that we are, we are happy to guide you through our wide range of mobility solutions so you can find the one that perfectly adjusts to you, your lifestyle, and requirements. Give us a call today or come visit our showroom so you can explore all we have in store for you.